oh, wow! i think he’s cuter than the girl bunnies! Oh! I love this boy outfit. That’s perfect when you don’t know if the baby will be a boy or a girl. Will it come with the pattern also? What an adorable bunny! I love the pants! Cute as a button, love the dungarees. Colleen – my sister, the hero, watched Oscar nearly all day while I worked! To stinkin’ cute. I can’t wait to make a bunny, or in my case several. I simply just can’t wait!!!!! From a mama of all boys who would totally let hers play with bunnies in dresses, but whose DH might frown a little. That is perfect. I love the boy bunny, his overalls are adorable. I have 4 boys so I think I’m going to try one of these! ADORABLE!!!! Love it! The overalls are perfect! You are so clever. I can’t wait to make them three little coordinating bunnies for Easter! Luke and I both love your site and your work! very smart outfit. And on a totally different matter… he is resting on a chenille bedspread? I’m sure my mum’s got one just the same. I used to love lying on it when I was younger, in the summer, after lunch… such soft ‘bobbliness’. That is the cutest bunny—I love it! You will get me sewing for sure. Wonderful! My daughter I both love your work. Coming here everyday makes me smile! sweet! the outfit and the fact that gmail is back. I don’t think there is anything wrong with boys playing with bunnies with dresses either, but… I’m still a novice at this ‘child thing’, however I am beginning to understand the sensitivity to other people’s comments and judgements. Particularly concerning gender definition, weight and development milestones. No, he’s not too pretty to be a boy. Yes, he’s on the small side. No, he cannot feed himself, walk or run… he’s only 4.5 months old for goodness sake! your work is so amazing. Coming to this site is always so fun. The boy bunny is perfect. Where do you get those cute chairs in the pictures? I’m a photographer in desperate need of props. Awww, this is so cute!!!!!! 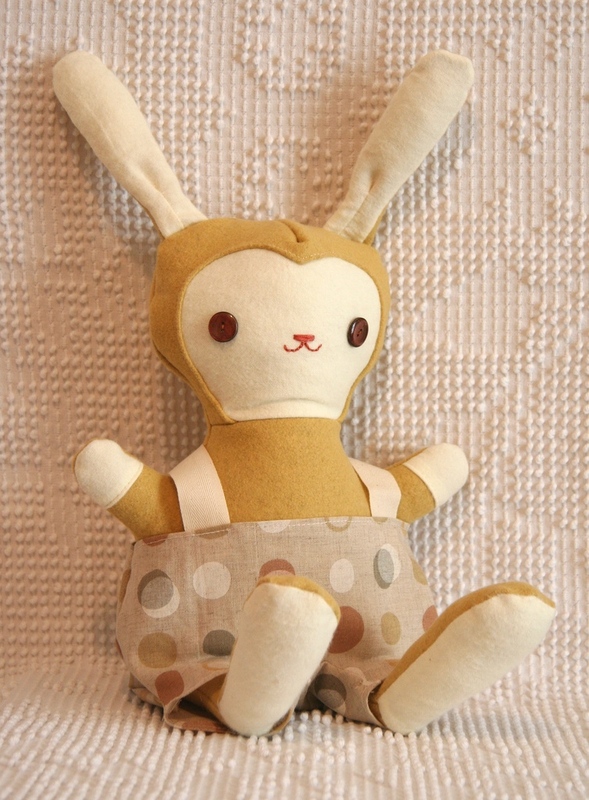 So cute le petit lapin.